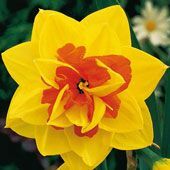 The gorgeous Daffodils derive their name from Narcissus, the legendary Greek hunter who fell in love with his own reflection – they're that good looking! 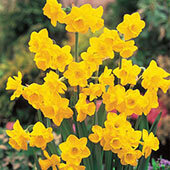 Owing to their early blooming season, daffodil plants have long served as a symbol of renewal or hope around the world, been associated with Easter in the United States, as also with New Year celebrations in Eastern cultures. 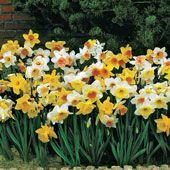 Our selection of daffodils comprises varieties worthy of their inherent meaning and symbolism, guaranteed to imbue your space with all the beauty and appeal that's expected of them! 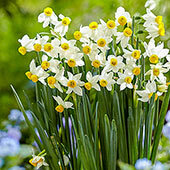 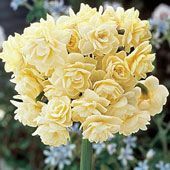 These prolific daffodils grow tall and straight; have strong stems and dependable blooms. 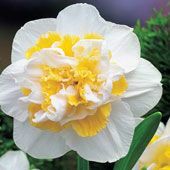 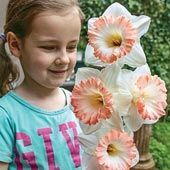 We carry the classic white and yellow daffodils, along with double-bloomers, pink daffodils and many more exciting varieties. 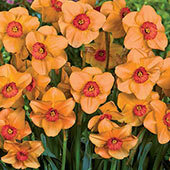 Our giant daffodils are a show-stopper planted in meadows or tall grasses. 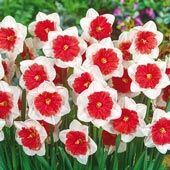 For rock gardens and window boxes, we've got some stunning miniature daffodils that'll win a lot of hearts and plenty of adulation! 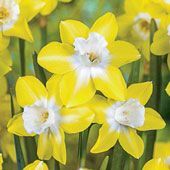 We also carry a wonderful range in daffodils for naturalizing, plus unusual stand-outs like Split-corona butterfly and Green-eye daffodils!